We packed an insane amount of stuff in to this weekend! Yesterday we went to meet my in-laws at their hotel because it had the holy grail of all hotel amenities-- a POOL! The girls took a little while to warm up to the idea of swimming (after being little fishies all summer!) but they spent most of the time jumping in to Matt's arms. I didn't go prepared to swim because I was going to take pictures, but when we got there the pool was waaaay underground and dimly lit, so pictures wouldn't have turned out very well. We spent the afternoon playing, doing yard work and visiting our new (to us) local library. Later I met my sister-in-law and her friends for her bachelorette party , or at least the first part of it, which was dinner at a great place called Poppy. I tried several things I rarely, if ever eat including sturgeon, duck and scallops. Oh, pickled plums. I wouldn't have eaten them if I knew what they were, but after I tasted them: YUM! I don't think it was TOO bad, a little too lumpy and I couldn't figure out how to keep the stems from bending while I was packing them in tightly. I also bought all of the colors that appealed to me and stuck them all together-- the finished bouquets won't have as many, I don't think. Unless SIL likes them! 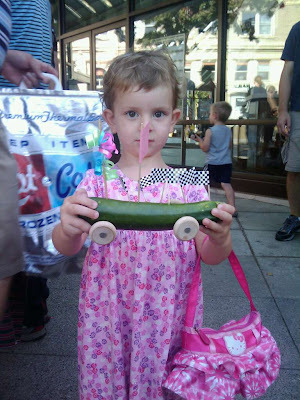 While at the market we participated at a booth where kids were making race cars out of zucchinis. It even had a long ramp with lanes for kids to race their creations! Seriously, it was the coolest thing. 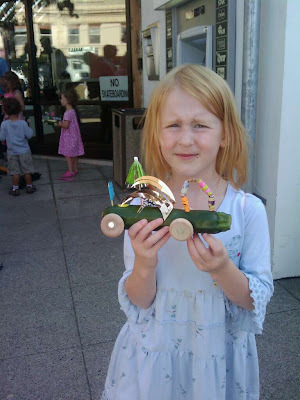 Eloise was so proud of hers, it beat most of the other cars it raced! And yes, Eloise made the whole thing with her pink Hello Kitty purse slung over her arm! After this we went home, wolfed down lunch then went up to the north end of town to celebrate two friend's birthdays at a beach on the Puget Sound! In September you never know if it will be nice for an outdoor party, but we all lucked out-- it was beyond gorgeous! We literally raced from this party back home to make it to a neighborhood s'mores roasting get-together in the park down the street from our house. I thought I was the only one bringing grills, and we were laaaaate!, so I was stressed! Of course, we get there and someone already had a grill. We chatted a bit with our new neighbors and the girls played some more. THEN it was back home for dinner and some relaxing. Iris has been declaring all weekend that she hates her teacher and her school. Now, she was there ONE day-- and really, it's a GREAT school. It's going to be the perfect spot for her, I can't imagine any place better!, but she hates it. I fear we're in for a bit of a struggle in the upcoming week(s). I made Iris a necklace that has a picture of our family on one side and a picture of her and I on the other. A child at Iris's preschool had a lot of sadness about separating from her mother and a necklace like that helped her a lot, so we'll give it a try. I cut up two nice wedding pictures, so it better work! Ha ha. Eloise still has her rash. It's so bizarre, it comes and goes depending on how warm her skin is-- so it's very dark and pronounced when she's in the sum playing or in the shower, but barely noticeable when she's calm and in her cool bedroom. I don't even know if she can go to school tomorrow. Grrrr. Hope you all had a wonderful weekend, as well!